Hi, I am interested in your 1967 Dodge Coronet (stock #4941-CHA) listed on Autotrader for $57,995. I'd like to get more information about this vehicle and confirm its availability. 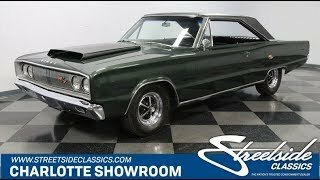 When you want a great all-around classic muscle car, you need to take a closer look at this 1967 Dodge Coronet R/T HEMI. It has a premium presentation as a shining hardtop, and it even has good manners on the road. But once you down shift the four-speed and really put your foot to the floor, the huge 528ci V8 opens up to reveal a 650 horsepower street-eating Mopar. Dodge really got the design right in 67. The vintage machine has a wide stance that can make this intermediate look full-sized. Theres plenty of style touches like the creases along the sides that flare out on the quarters, and full-width electric shaver style grilles for both the front and rear. Of course, the huge hood scoop and glowing red R/T badges instantly lets everyone know this is not your average classic coupe. But beyond the aggressive looks, there is a great vintage style. You see it in the premium black vinyl roof and iconic Mag wheels. The factory-correct Monotone Racing Green has a subtle elegance thats amplified by a professional respray that adds a terrific metallic depth. So this was born a crisp and dignified muscle machine, and you can instantly tell there was a solid investment to keep it that way. This feeling of vintage premium continues inside, and we love it when a vinyl roof is a preview of the interior color. This was ordered directly from Dodge, and someone was careful to craft a cool machine. That means bucket seats and an artful center console in-between. Everything is quite clean and correct, so youll love rolling down all the windows on this pillarless hardtop so everyone can get a better look inside. Of course, the best view is from behind the wheel. You get the classic sports steering wheel with the vintage Dodge logo in the center, and beyond that is the ultra-wide speedometer flanked by all the accessory gauges. Even the original AM radio is still on display! And that cue ball shifter in the center is your gateway to something very special. While this genuine R/T follows its factory specs pretty closely inside and out, one look under the hood, and youll see that the restoration to the engine bay was all about major upgrades. This was originally a 440 car, but now youre looking at a 528 cubic-inch HEMI stroker beast. More than just a monster displacement, this performance V8 was enhanced and fortified in all the right ways. It includes an Eagle rotating assembly, Indy cylinder heads, MSD ignition, March pulleys and an aluminum radiator w/dual electric fans to keep it running cool. It inhales as deeply as it wants thanks to dual Edelbrock four-barrel carburetors, and exhales with authority as TTI long tube headers feed a performance X-pipe dual exhaust. The full package is estimated at 650 horsepower! But dont let the numbers intimidate you, because this was built to be a great cruiser when driving with a light foot. Its only when you peg the accelerator that the secondaries open and you release the beast. That sounds like the perfect weekend fun where its easy to show off, and then you leave them all behind whenever you feel like it! In fact, you really are in complete control of this classic Mopar monster thanks to the four-speed manual transmission, limited-slip rear end, and sway bars front & rear. Theres even a SSBC Force 10 Extreme four-wheel disc brake kit for the ultimate stopping power. This is the well-presented rare Mopar that also has the heart of a beast. Its the ideal all-around classic, and its ready for the first person to grab it. Call now!